Anybody with a newborn is all too familiar with the act of hushing or shushing their baby in efforts to calm them. While this may seem like a basic requirement for baby care, The Gro Company makers of the every popular Grobag, has a nifty new product that can help parents with this task. One may question whether something like this is really necessary, but most new moms are pretty tired, possibly frazzled and those who are nursing may be dehydrated and not keen on making their dry mouth worse. 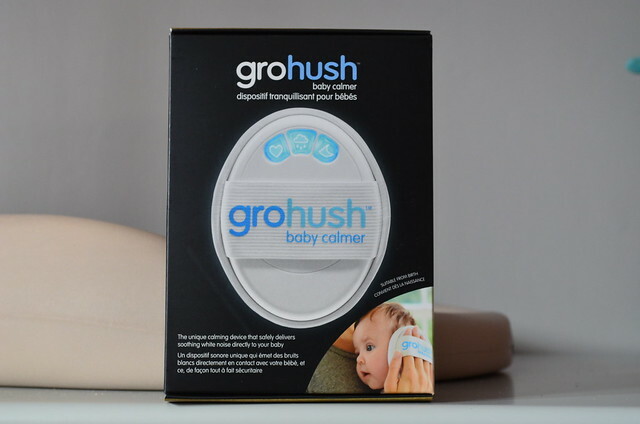 The Gro-hush has three sounds to pick from: heartbeat, rain and ocean waves, which sounded most like traditional white noise. The sound level is preset at 75 decibels (mom or dad’s voice in a baby’s ear is around the 80-90 decibel range) and can’t be changed, so you know it is a safe level for newborns and babies, which is a great feature. The noise can only be heard by baby and automatically shuts off after 10 minutes, which is handy. The cover is a very soft, washable jersey cotton and it comes in a small hard-sided travel case that is ideal for tossing into a diaper bag for calming on the go. 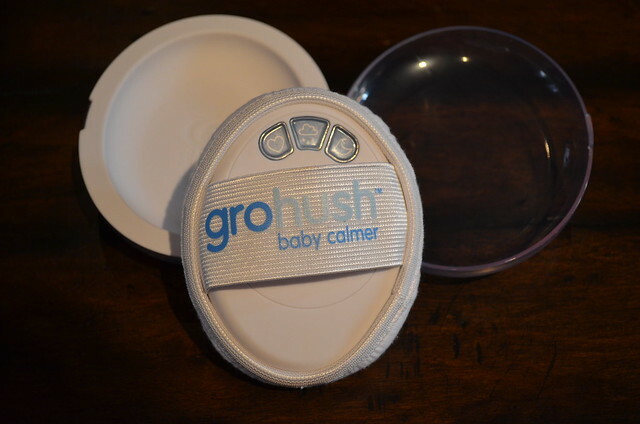 The Gro-hush requires three AAA batteries (which are not included) and retails for approximately $49.95 Canadian. It’s widely available at major baby boutiques and various online retailers. This may not seem like a must have item, but it would make a fabulous shower or baby gift for a mom who already has all the big ticket items or is the “mom who has everything”. 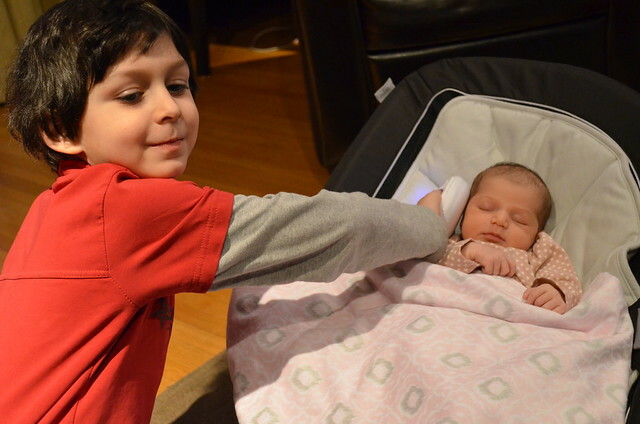 We tried it out when our newborn was pitching an epic fit and she calmed down almost immediately. Our son has been sleeping with white noise for over 4 years and we swear by it. I think the Gro-hush is a great new product and suspect it will be used quite frequently around here in the coming year. Have you received or given a baby gift that wasn’t necessarily something you would have purchased yourself but turns out to be an item you or the new mom just can’t live without? Disclosure: I received a sample of a product to facilitate my post. All views and opinions stated on this post are 100% my own. She is precious and her brother is so cute helping with the gro hush! this sounds like a great idea, calming both baby and mother I’d think. I just wish my daughter had had something like that when her son was born 2 yrs ago – he hasn’t slept through a night yet! Or for my daughter who screamed for the first 3 mths practically non-stop – the Dr said she was just a cry baby! I love this! Wish it was around with my first. Love the washable cover and the 10 minute shut off. 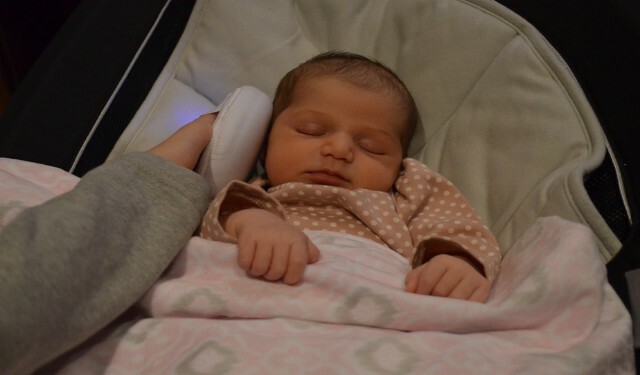 We used a white noise machine which worked well, but this is so much better. I am not too sure if I would purchase it,but an interesting product. This sounds like a wonderful product for parents with newborns. I also believe that white noise is great for helping babies sleep well and develop. This is a neat product!